Hydrogels also can be used in drug delivery, for example, as coatings for drugs. However, questions still remain about the efficacy of the drug delivery as it's not clear how proteins in your body interact with the hydrogels. "If you put a hydrogel in your body, there are proteins in your body that can then interact with that material," said Lydia Kisley, a Beckman-Brown Interdisciplinary Postdoctoral Fellow. "Ideally you want proteins to maintain their function and their structure, so there's not any adverse effects." Kisley, a chemist, and other researchers at the Beckman Institute for Advanced Science and Technology at the University of Illinois recently used Fast Relaxation Imaging (FReI) to investigate the folding stability and dynamics of proteins within polyacrylamide hydrogels. Their findings are published in "Direct Imaging of Protein Stability and Folding Kinetics in Hydrogels" in ACS Applied Materials and Interfaces. "We're trying to understand how proteins behave in these material environments," Kisley said. "There are not many tools available to do that. 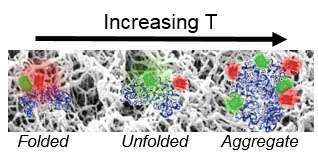 This paper was the first demonstration of the new imaging technique to understand proteins in a material." The group used a fluoresence microscope in the lab of Martin Greubele, a professor of chemistry and member of Beckman's Nanoelectronics and Nanomaterials Group. FReI detects protein unfolding in situ by imaging changes in fluorescence resonance energy transfer (FRET) after temperature jump perturbations. "The unique thing that we add here with the microscope is a temperature change. By using this very fast temperature change, we can tell how the protein responds to temperature and how stable it is. And how the confinement and chemistry of the hydrogel changes the protein stability as well," Kisley said. "Although these materials are very compatible, since they have high water content, we found that at low temperatures when the protein is unfolded it's okay, but once the protein starts to unfold a little bit it will start to stick to the material, and may actually promote more proteins to aggregate and stick to it, so it suggests that the protein is destabilized a bit," Kisley said. "It was a more complicated system than we were expecting. I thought it would be simple, but that's pretty common in science where things end up being more complicated than you expect." Kisley's fellowship at the Beckman Institute has allowed her to connect her doctoral research in diffusion and adsorption of proteins in hydrogels to protein folding in hydrogels and additional surface and polymer brush samples.